Whatsapp has become so common these days.It has approximately 1.1 billion active users. It is not only for the smart phone users you can also download it to your Windows/Mac PC and join your friends on whatsapp. Through Whatsapp you can chat with your friends and also share Images and Videos.It almost decreased the normal text messages all are using this messenger to contact with friends. Recently popular messaging app BBM ( Blackberry Messenger ) was released for android and IOS users as a competitor to Whatsapp but it may be tough for BBM to beat Whatsapp you can aslo check BBM Vs Whatsapp review. 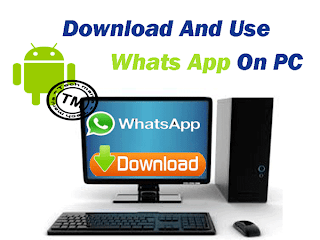 You can download Whatsapp for Android phones,Windows phones, Blackberry, Iphones and Nokia Symbian directly from the official Whatsapp Website. If you have any installation problems you can visit my last article Play Android games on PC, You can find the installation procedure over there. Search for Whatsapp in the search panel. It says Searching for apps and you can see whats app messenger. After this your download begins, wait till the download ends. Now you can see the downloaded apps in My apps section. Click on Whats app to launch it. For the first time use it asks to verify your number. Verify your phone number and now your whatsapp is ready to use. If you are already using Whatsapp on you android phone you can synchronize your contacts to your PC. Click on the gear icon on the right side bottom of the screen. Select Cloud Connect from the menu. Then select that you already have an android phone. Enter your your google Playstore account which you are using on your android phone. Now you can chat with your friends through Whatsapp from PC. Error 25000 Blue stack does not recognize your Graphic Card this is displayed while installing Bluestacks sometimes. If you are using a laptop connect it to a Live power source and install because Graphic card requires high power. Thank you.. I am using whats app on my computer now but can we download BBM as the same way you mentioned above using Bluestacks?? As of now you cannot download and use Bluestacks in the same way. We will post the method soon.. Does using watsapp on pc will create any problem for watsapp in my phone..
Yeah it creates problem. You can not use Whatsapp on Both devices simultaneously.If you use in one the other logouts automatically this makes to verify number again and again. If you don't this you can use it on both devices. how if I don't have whats app on phone? can I use just whats app on pc?? yes, you can use on PC just follow the above procedure and you can use it on your PC. You need to just confirm your number with the verification code sent. Uninstall and install Bluestacks again. If it still remains the same then try Bluestacks app player for Windows only. it requires 2 gb of physical memory???? I am not getting this!!! It is necessary to attach mobile with pc. why not installed software autoCad and staad pro in win 8. error .Net Frame Works 3.5 Why? i open start blue stacks but it was see loading..i wait at least 30 minutes..but it sees only loading..so what can i do?? Can I use it on my PC and also on my Phone at the same time? If not is there a way to use in my PC and also together with my phone? I hate verifying it every single time I need to use either of my devices.